Cian graduated from University College Cork with a B.A. (hons), MA and completed his legal training with a busy general practice in Cork city. During his training Cian won first place in the Law Society’s Negotiations competition and second place in the Society’s Client Consultation competition. After qualifying as a solicitor, Cian worked in the Corporate and Legal Dept. of Deloitte Ireland before joining Fachtna O’Driscoll Solicitors in 2015. Cian is a member of the Corporate Governance Association of Ireland, the Employment Law Association of Ireland and the Construction Bar Association of Ireland. 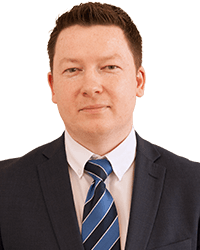 Cian has a keen interest in employment law, business law and related litigation including data protection (GDPR) matters. Cian also practices within our family law department. “I found Cian excellent to deal with. It was easy to tell him exactly what I wanted and work with him to get it done.” Co-founder of a technology startup. “Cian is an exceptionally skilled, knowledgeable and approachable solicitor. Great to work with on any legal matter.” A local business client.